It has been a rough couple of weeks. 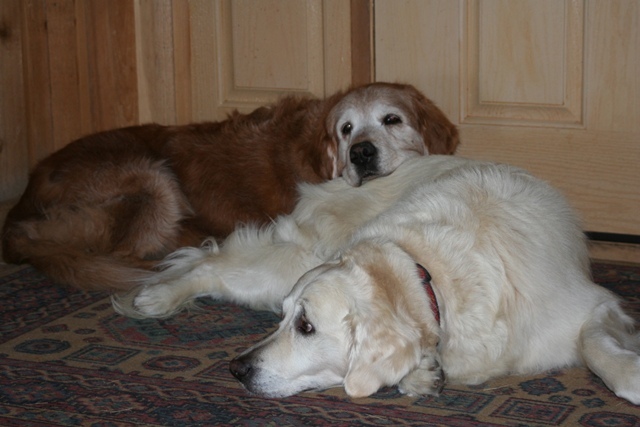 Oriel, who died 2/22, and whom I imagine running across an endless dog beach in the sky, has, in less than 10 days, acquired the company of two other dogs from my extended family. We were all multi-dog households, so my mom, my aunt, and I were spared the emptiness of a dogless house, but we each feel the loss of our friends very deeply. No dog is like any other, and no two dogs fill the same role in our lives and our families. We love each dog differently, appreciating (and sometimes lamenting) who they are as individuals. No dog who’s been loved for him- or herself can be replaced by some other “equivalent” four-footed bundle of fur and personality. Some dogs are so easy to love. Oriel embodied everything people idealize about dogs. Quiet, affectionate, optimistic and adventurous — and always eager to help — Oriel was a walking teddy bear. She was always happy to cuddle and be cuddled; she gave hugs and patted us back, gently, with her paw. Her “sister,” opinionated, vocal Jana, will accept petting and cuddling only on her terms and in her time. Wylie loves to be petted and stroked, but he demands it and lacks Oriel’s gentle softness in accepting our touch. Buddy, my mom’s little terrier, and Shaina, my aunt’s beagle mix, filled the “Oriel” role — asking for and eagerly accepting tummy rubs, leaning against someone found to be sharing “their” sofa, seeking out our company and our touch. The remaining dogs in their households are more like Jana when it comes to being petted. Wanting someone to snuggle with is a big reason we share our homes with dogs, but it’s certainly not the only one — and different cuddle styles are far from the only individual differences among our dogs. Some dogs are obsessed with food; others are obsessed with toys. Some love to go for meandering walks, sniffing every tuft and leaf; others are athletes eager for a three-mile run. Some live only to please us humans; others believe they would do a far better job of running things if only we’d get out of their way. Dogs’ individual differences are as varied and complex as humans’. That’s why Bergin University, where I teach, pays so much attention to matching the service dogs it trains with people whose personalities are a close match. An outgoing, athletic person will not enjoy a twenty-four-hour-a-day partnership with a couch-potato dog. A person who craves a cuddler will be disappointed with a service dog who is all business and only grudgingly accepts petting. While our pet dogs do not have to be as close a match as a service dog, compatibility still helps . We certainly find some dogs easier to live with and manage than others. Dog people tend to build relationships with lots of dogs with lots of different personalities over our lifetimes, and, if we’re lucky, we learn to find the ones who best match our personalities and lifestyles. Regardless, learning to adapt to the peculiarities of our canine family members helps us become more tolerant of the humans who share our lives. Whatever role a specific dog plays in our life, it’s always hard to lose a friend. Knowing that there are many more wonderful dogs out there who would love to be part of the family is no comfort. Each dog is as unique and irreplaceable as each person. Each earns a unique place in our hearts. And the death of each one leaves an empty space in our lives. Sweet tribute. I know that no new puppy can replace a recently lost older dog…..but, it sure would be nice for folks to tell you stories about introducing new dogs into the family. We’re all sad to lose a canine friend, dogs and humans in the family alike, but bringing in someone new can meet with resistence.